DAFT PUNK not actually a song but a monologue with daft punk background beats. A different way of letting students listen to English with a foreing accent. It is suitable for revising simple past, regular and irregular verbs. 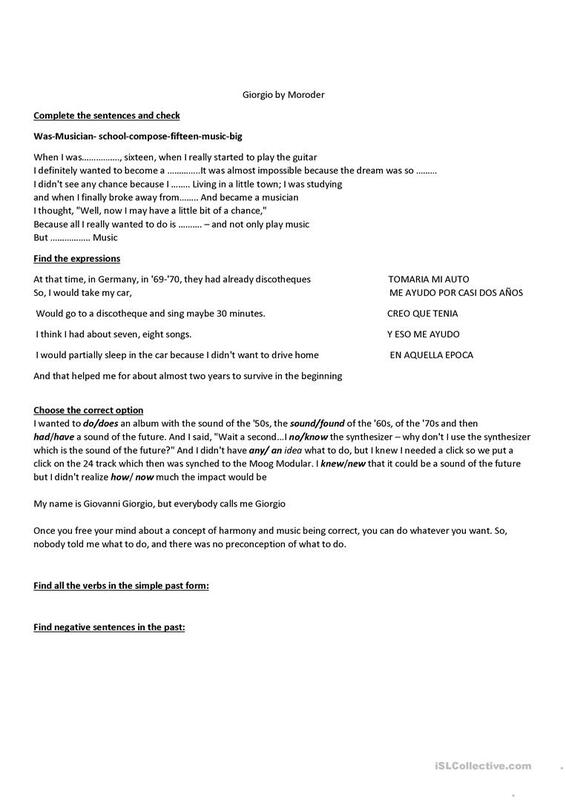 It can serve as a model for students to write their own biographies which at the same time and with the help of ICT they could even record themselves and edit their presentations so as to come out with something similar to this "song". The above downloadable teaching material is intended for high school students and adults at Elementary (A1) level. It is valuable for teaching Verb patterns in English, and is excellent for improving your groups' Listening, Speaking and Writing skills. marielasreinaffe is from/lives in Argentina and has been a member of iSLCollective since 2012-04-09 01:29:51. marielasreinaffe last logged in on 2016-03-31 14:11:00, and has shared 6 resources on iSLCollective so far.